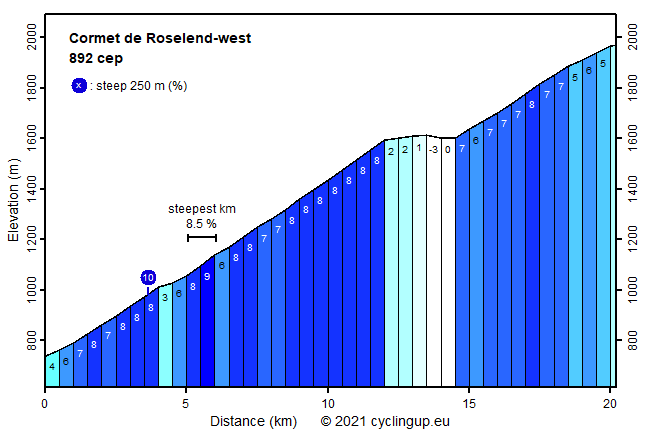 The Cormet de Roselend, what a wonderful name, is part of the Route des Grandes Alpes. Nevertheless and fortunately, there is not much traffic on the road. The first 850 elevation meters from Beaufort to the Col de Méraillet are a bit boring. The road runs through the forest all the time so views are scarce and the slope (mostly 8%) varies little. The remaining eight kilometers to the pass are utterly beautiful. Of these the first 2.5 kilometers lead more or less horizontally along the green-blue Lac de Roselend, a reservoir with, at least when I was there, a vegetated shore because the lake was filled with water. Up to the pass nearly 400 elevation meters through a magnificent mountain landscape remain. First, the road goes up with some turns and hairpin bends on the northeast side of the lake, then it passes through a narrow opening between two steep mountain faces and finally it runs through green alpine meadows and along a beautiful stream. All in all, the road is nowhere very steep with a steepest kilometer of 8.5%.